Presentations can often leave audiences confused or distracted. Learn Forward developed Hypersay, a solution built to run on IBM® LinuxONE™ technology, which transforms presentations into conversations with real-time interaction and feedback—empowering speakers, engaging audiences, and encouraging effective knowledge transfer. Often during presentations, audiences lose concentration or hesitate to ask questions. How could Learn Forward help speakers engage with audiences more effectively? With IBM LinuxONE as their platform of choice, Learn Forward’s Hypersay takes PowerPoint presentations to the next level through digital audience interactions such as quizzes and real-time feedback. Have you ever sat through a presentation where you felt too nervous to ask questions? Or where your attention drifted, and you missed important information? Learn Forward wanted to help speakers engage with audiences more effectively, from the classroom to the boardroom, so that no-one gets left behind. Cristian Dinu, Co-founder and Technical Leader at Learn Forward, takes up the story: “At school, when I was confused about something, I always hesitated to ask questions because I felt like I was the only one who didn’t understand. This meant I struggled a lot, because building knowledge is like building a house—you can’t do it on an unfinished foundation, just like you can’t get to grips with complex mathematics unless you understand the basics. “These issues extend into our professional lives. For example, a salesperson might try to sell me a product that would be very useful for my company—but if I don’t ask questions and get my concerns addressed during the presentation, I won’t buy it, which means both of us lose. Learn Forward saw an opportunity to harness technology to take presentations to the next level, supporting both presenters and their audiences. Paul Balogh, Co-founder and CEO at Learn Forward, continues: “Our mission is about enabling communication between a presenter and each and every person in the audience, in real time. We wanted to create a solution that enhanced presentations through interactive additions. These include quizzes to help hold audience attention, and functionality for audiences to give real-time feedback and ask questions digitally. Learn Forward approached managed services provider and systems integrator Cognition Foundry for the right technology on which to build its new solution. Cognition Foundry was formed in 2016 by CEO Ron Argent, with the intent to work with startups to get them access to technology that is used by large institutions and enterprises. In a sense, to “democratize IT”. Rather than offer funding which could dilute or indebt Learn Forward, Cognition Foundry uses the unique architecture of IBM LinuxONE to keep the costs of growing down while revenues increase. Backed by LinuxONE and the Cognition Foundry team, Learn Forward has successfully developed Hypersay, a solution that enables users to turn their PowerPoint files into engaging presentations that feature real-time interactions with audiences. Paul Balogh elaborates: “Hypersay is very simple to use. The speaker, for example a teacher, can drag and drop their PowerPoint file into Hypersay on our website. They can then add interactive elements to the slides, such as questions, polls, videos, and extra content, to increase audience participation and engagement. Paul Balogh continues: “On the other side of the podium, Hypersay empowers each and every audience member to participate and ask questions, so no-one gets left behind. Audiences also feel more engaged, encouraging effective learning and knowledge transfer. “For example, Eton College ran a survey with their students after using this technology, and found that the students were much more eager to take notes, as they preferred typing to using pen and paper. By building Hypersay to run on LinuxONE, Learn Forward has benefited from the platform’s flexibility, scalability, reliability, security, and cost-effectiveness. Ron Argent notes, “LinuxONE offers the flexibility of open-source technology, a key factor for startups. The ability to quickly move code from one platform to another to help them get their product to market, at a cost that’s affordable, is absolutely paramount. Paul Balogh concludes: “LinuxONE is a platform of the past, present, and future—it’s based on a design that has withstood the test of time, and the engineering is world-leading and constantly developing. To have a platform that has already lasted decades, and that is going to last for years more into the future, is a very comforting feeling. Founded in 2015, Learn Forward is a London-based startup set up to bring digital educational content to teachers. The company has developed the technology to power a new generation of digital textbooks, which students in three European countries use daily. 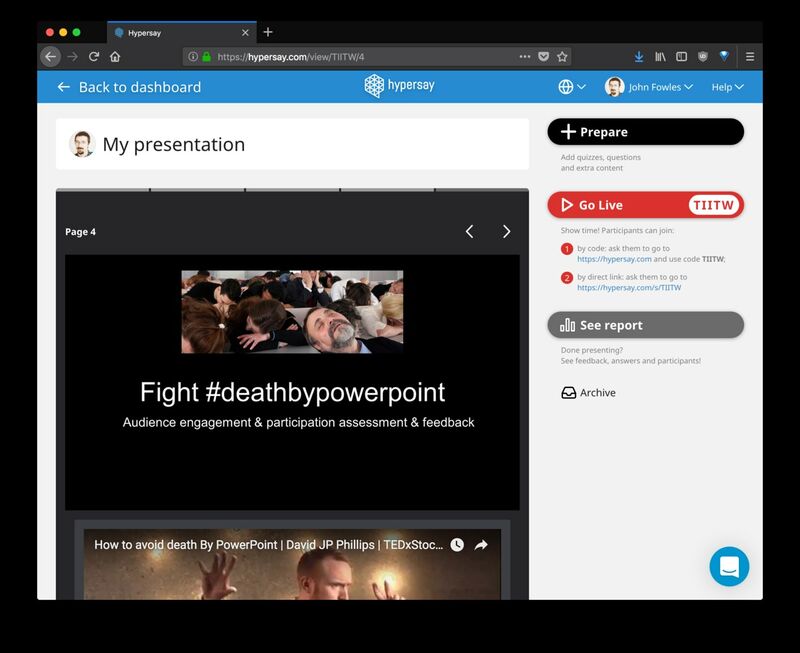 In 2017, it launched Hypersay, a new tool for teachers, lecturers, and conference speakers to enhance PowerPoint files and engage audiences using real-time interactions. Hypersay’s 10,000+ users come from a wide range of schools, colleges and higher-ed institutions in more than 100 countries, including: Eton College, University College London, University of Bolton, University of Cambridge, University of Southern Mississippi, and more. © Copyright IBM Corporation 2018, IBM Corporation, 1 New Orchard Road, Armonk, NY 10504 U.S.A. Produced in the United States of America, January 2018. IBM, the IBM logo, ibm.com, and LinuxONE are trademarks of International Business Machines Corp., registered in many jurisdictions worldwide. Other product and service names might be trademarks of IBM or other companies. A current list of IBM trademarks is available on the Web at “Copyright and trademark information” at ibm.com/legal/copytrade.shtml.